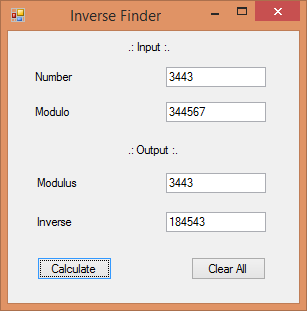 This is a tiny calculator specially designed to calculate the inverse of a given number in a given modulo. Inverse are widely used in Finite field (Galois field) calculations and cryptography while using Public Key Infrastructure. So overall it is a must have for mathematicians, physicists and computer scientists. Download links and screenshots are as followed. 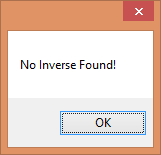 Step 1: Run InverseFinder.exe. No need to install it. It will open a window like this. Step 2: Enter values for Number whose inverse you need to find and the Modulo. Step 3: Click on Calculate button and it will display Modulus and Inverse values of the given inputs. Click on Clear All button to clear all values. 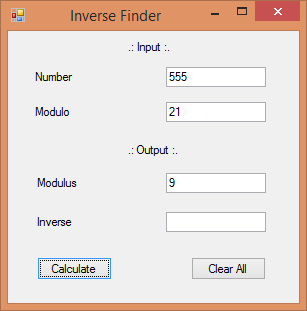 Step 4: If inverse is not possible it will still give you modulus. Step 5: A message will be displayed and the value will be blank if inverse does not exist. Step 6: Just another example.